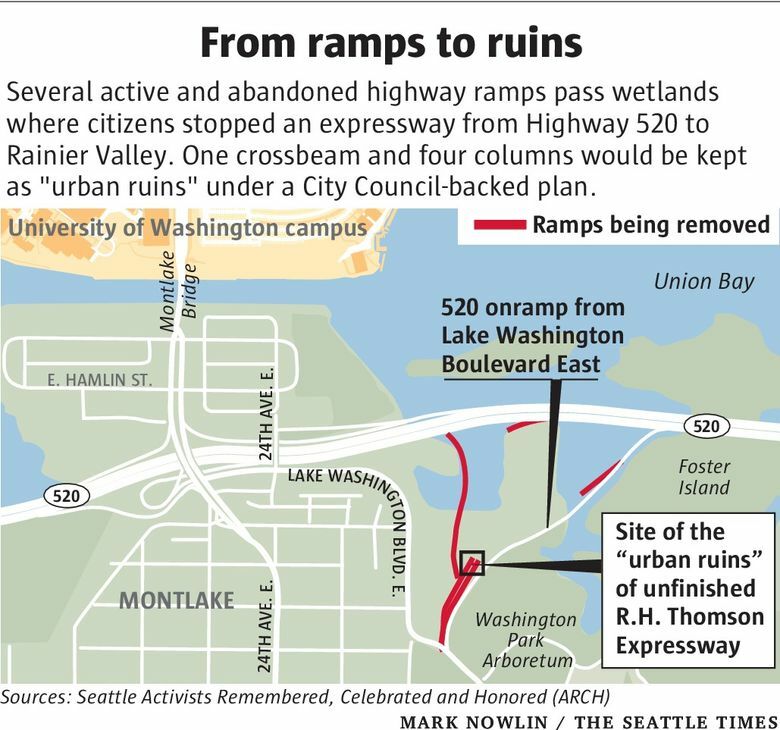 Some historically minded citizens want to preserve part of the Highway 520 “ramps to nowhere,” to honor local resistance to endless freeways. 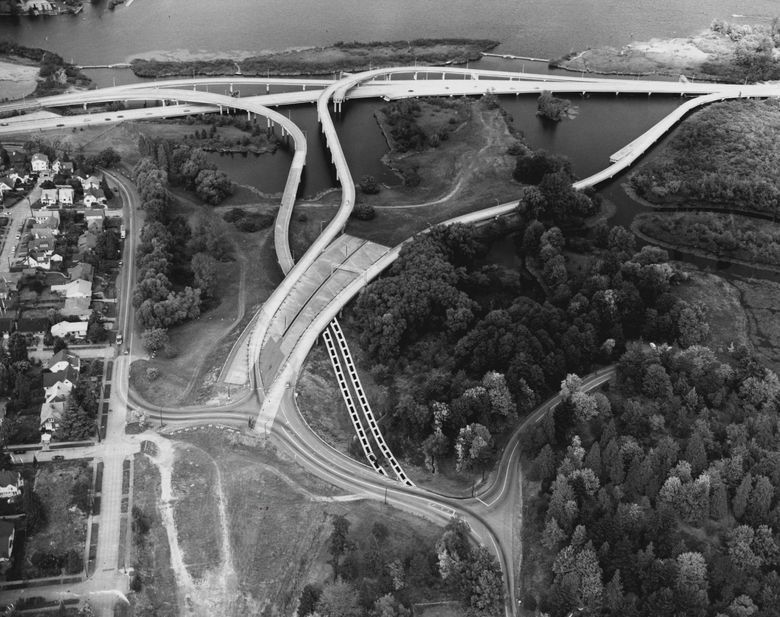 The “urban ruin” is part of a planned expressway canceled by voters in 1972. 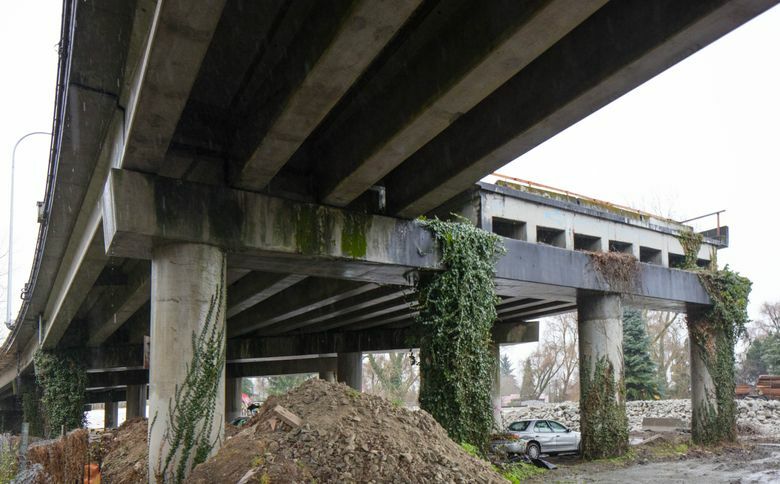 It’s not quite Stonehenge, but historically minded citizens seek to preserve part of the Highway 520 “ramps to nowhere,” to honor local resistance to endless freeways. They’re eyeing a concrete piece that was built in 1963 to feed traffic from Highway 520 into the planned R.H. Thomson Expressway through the Central Area and Rainier Valley. Another freeway loop would have gone north through Lake City. Instead, a coalition including homeowners, university students, urban-design advocates and the Black Panther Party marched and testified against the program, culminating in a 1972 citizen vote that killed the project. The Central Area was a predominantly black community — historically redlined away from other neighborhoods — where hundreds of homes would have been demolished. “It was all about black political and community empowerment, and we did not think a freeway ought to be coming through our community,” recalled former student activist Larry Gossett, now a Metropolitan King County Council member. Gossett lived on 15th Avenue, eight blocks from the proposed expressway. “We would go door to door and say, ‘Did you know this new freeway, they didn’t look at other options? Did you know that seven of the last 10 freeways that received federal funds, they were in poor black neighborhoods?’ ” he said. The Washington State Department of Transportation (WSDOT) proposed a few years ago to mark that history with a plaque as part of its ongoing replacement of the old Highway 520 bridge across Lake Washington. They want to maintain four columns and a 76-foot-wide crossbeam, which together form what’s called a “bent” to support the ends of road decks. This piece would have carried traffic between 520 and the canceled expressway. One edge of it supports an active onramp for the floating bridge to Bellevue. Generations of young adults have picnicked nearby or walked up an abandoned flyover ramp to make the 38-foot leap into a Lake Washington backwater. A group named ARCH (Activists Remembered Celebrated & Honored) persuaded the Seattle City Council to adopt a resolution in mid-October to endorse the ruins and do a seismic study. A documentary called “Freeway Revolt” is coming this spring, by UW-Bothell professor Minda Martin. The remnant would be “a cultural artifact, symbolic of the citizens’ movement that saved Seattle neighborhoods from further highway construction, and as a reminder to future citizens of the power of participation in our democracy,” the council wrote. Seismic consultants found that the concrete piece, supported by columns 60 feet deep, “is structurally sound and not expected to experience sudden failure under its self-weight” in a 1,000-year quake, in a report to Councilmember Debora Juárez. It’s located on a former landfill, which became a peninsula. After the state finishes its ongoing 520 rebuild, the city parks department would be responsible for maintaining any ruins and Washington Park Arboretum eventually would take over the property. How much extra will it cost to extract the concrete beams around the ruins, instead of smashing the whole roadway? Would it be considered an art project and thus ineligible for state money? Does community support exist beyond a cadre of history enthusiasts? Seattle Parks & Recreation development director Michael Shiosaki, husband of Mayor Ed Murray, prefers a full removal. WSDOT is still reviewing the ruins request. The state needs to act before midyear, prior to soliciting bids for the next phase of the 520 rebuild, including some ramp demolitions, spokesman Steve Peer said. Cities only rarely keep remnants of discarded freeways. Seoul, South Korea, dismantled its central-city Cheonggyecheon Expressway to restore a creek and develop a park, but left a few highway columns in the water. In Toronto, about 20 columns remain standing as art from an eastside segment of the Gardiner Expressway that was unfinished due to citizen opposition. Sporadic calls to retain some of Seattle’s Alaskan Way Viaduct, after its replacement by a tunnel in 2019, were dismissed by government agencies. ARCH spokesman Rainer Metzger says a freeway remnant alongside Highway 520 is the opposite of preserving a retired roadway like the viaduct. “We’re creating a ruin that symbolizes the movement that stopped this highway, that prevented it from becoming this 40-mile-long highway through Seattle,” he said over the clang of a front-end loader moving tangled rebar from other demolished decks. The UW’s Arboretum and Botanical Garden Committee supports the ruins plan, but it took years of discussion to reach this point, said Iain Robertson, a UW landscape architecture professor and committee member. Arboretum guardians worried about a previous concept to keep a ramp span over the water, because of damage to wetlands, he said. Members were uneasy leaving a tall concrete structure in a place devoted to trees and nature. Those columns were wrapped in 2014 with mirrors, a temporary artwork devised by Metzger for kayakers to approach and reflect. After the idea of a permanent tribute evolved into shorter ruins onshore, covered by vines, the Arboretum committee grew to embrace it, Robertson said. The proposed ruins remind him of what the British called “a folly” in the 17th and 18th centuries, when nobles commissioned stone rooms, castles or pyramids to give their estates a classical look. Instead of carrying motorcars, the old bent may endure as a gateway, where people enter the Arboretum on foot or bicycles.